The Eastern Ghats are a discontinuous range of mountains along India’s eastern coast. This vast landscape harbors an assortment of habitats and an incredible diversity of wildlife. The king cobra (Ophiophagus hannah), the world’s longest venomous snake, can be found in the Eastern Ghats. However, snakes have always been an object of fear and superstition in India. Each year over 46,000 people die from snakebite in India, which accounts for almost half of worldwide snakebite deaths. Rural communities in the Eastern Ghats of India are primarily poor and lack access to appropriate medical care when a snakebite occurs. The current solution for mitigating this snakebite crisis is to indiscriminately kill snakes, including king cobras, which has contributed to the species decline. Such fear and persecution of snakes across the Eastern Ghats indicate a deep intolerance of snakes among local people. Baseline data of king cobras in the Eastern Ghats is rudimentary, requiring further study to address this snake’s conservation needs before the current threats extirpate this iconic species from the region. To protect king cobras in South India, Save The Snakes supports the Eastern Ghats Wildlife Society (EGWS), which is the Founding Partner of our organization. Since 2016, the EGWS has organized snake awareness workshops, media campaigns and community outreach programs in identified villages throughout the Eastern Ghats of India. They also train identified local individuals in rescue and rehabilitation of snakes and snakebite first aid techniques. These “para-ecologists” will also act as liaisons between local communities and wildlife authorities through regular communication on incidence of snakebite. These community outreach efforts have paid off, because on September 24th, 2018, members of EGWS in collaboration with Andhra Pradesh Forest Department successfully rescued a 12-foot-long king cobra at Madugula Village in Visakhapatnam district, South India. The snake was originally discovered on a farm, but instead of killing it, the landowner called a local snake rescuer, Ventakesh, who has been previously trained by EGWS. The snake’s health was assessed and scientific data was gathered. The snake was then released close to where it was found in the Chodavaram forest, which is a part of the Eastern Ghats range. 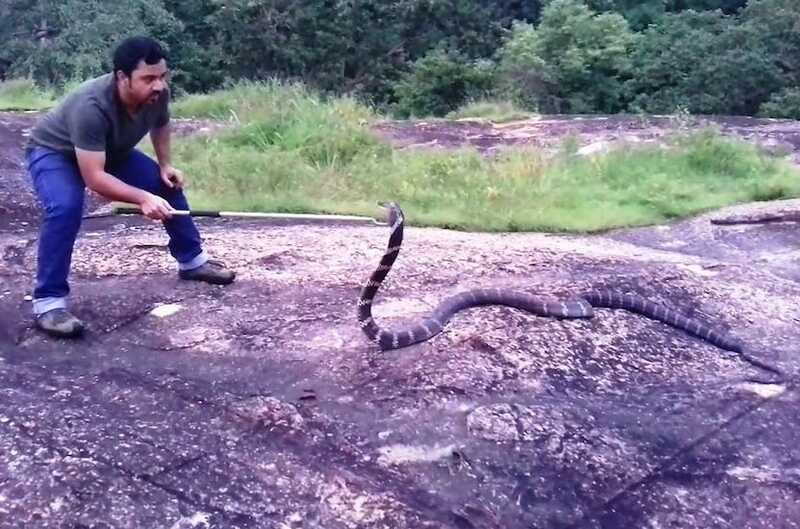 This is the first recorded rescue and release of a king cobra in Vishakhapatnam, India! The rescued king cobra was a truly impressive animal and it weighed 11kg! This event is tremendously important, as it proves that by implementing community initiatives and education strategies, we can discover solutions that are mutually beneficial to both human and snakes. Local snake rescuer and para-ecologist, Ventakesh, is thanked for his excellent work and is given new snake handling equipment, whch will help him safely rescue more snakes. Save The Snakes is grateful for all the incredible efforts from the Eastern Ghats Wildlife Society and from the generous support from Andhra Pradesh Forest Department and our supporters. The story of the king cobra rescue and release was published in The Times Of India. Please donate today to help us continue to fund the dedicated snake conservation efforts of the Eastern Ghats Wildlife Society in India. Save The Snakes depends on the assistance of generous people like you to help fund international snake conservation efforts. Thank you for your support. Previous Post International Snakebite Awareness Day!